In May 2431 new titles for the `Archaeological Bibliography´. Evaluated 197 monographs and 100 volumes of periodicals! E.Guhl, W.Koner, The life of the Greeks and Romans (1875), 200 p.
Permit some addidional information to our recent activities: Every month we are adding a large quantity of new titles to the data content of Dyabola, usually far more than 2000. Our main objective is the scientific classification of literature of all kinds: articles, contributions in catalogues, reviews, monographs, etc., searchable via the Systematic Tree. With a such a huge monthly data input, the “branches” of the “Systematic Tree” are getting heavy with the amount of titles. To ensure a useful search keeping you sufficiently well informed, we devide these branches from time to time, helping the “Systematic Tree” to grow. Besides the way it growths could offer some information about the areas of current research intrests. 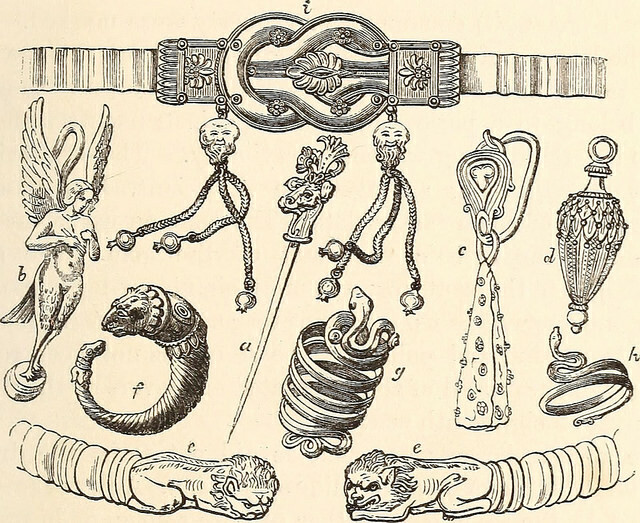 We have had to create new categories for the “branch jewellery – collected materials”, which held more than 2000 titles, because jewels have obviously become of increased interest in the context of excavations. In May we have evaluated 197 new monographs and 100 new volumes of periodicals, gaining 2431 new titles for the “Archaeological Bibliography ”. You will find the list of new monographs (also in pdf) and periodicals below as ever. Any advice and suggestions regarding content will be highly appreciated: please mail to Dr. Martina Schwarz. Concerning technical support please contact info@dyabola.de. Albano Laziale. Il circuito archeologico monumentale. (Albano, Soprintendenza per i beni archeologici dell’Emilia Romagna, 2015), ed. De Angelis, D.
Altamore, G.; Bettini, M.C. ; Binaco, P. u.a. :Circoli di pietra in Etruria. Vetulonia, Orvieto e Grotte di Castro. [Vetulonia, Museo civico archeologico, 12 Iuglio 2014 – 11 gennaio 2015, Orvieto, Museo archeologico nazionale, 11 luglio 2014 – 7 gennaio 2015, Grotte di Castro, Museo civico archeologico, 13 luglio 2014 – 7 gennaio 2015. ](Siena, ARA edizioni, 2014), ed. Rafanelli, S.
Amore per l’antico. Dal Tirreno all’Adriatico, dall preistoria al medioevo e oltre. Studi di antichità in ricordo di Giuliano de Marinis. (Roma, Scienze e Lettere, 2014) 2 Bde., ed. Baldelli, G.; Lo Schiavo, F.
Aristotle’s “Metaphysics” Alpha. Symposium Aristotelicum. (Oxford, Oxford University Press, 2012), ed. Steel, C.
Auf den Spuren versunkener Kulturen. Die grossen Archäologen. (Berlin, Parthas, 2014), ed. Fagan, B.
Catania. 1870 – 1939. Cultura, memoria, tutela. (Palermo, Regione siciliana, 2011), ed. Aprile, I.D. Cenciaioli, L.; Bertacchini, M.; Venanti, B.: Perugia. La città antica sotto la cattedrale di S. Lorenzo. I risultati degli scavi. (Napoli, Edizioni scientifiche e artistiche, 2014), ed. Cenciaioli, L.
Columna Divi Marci. Corpus dei disegni 1981 – 1996. (Roma, Modus, ) loose folded leaves of plates, ed. Martines, G.
Corpus iuris civilis. Die Institutionen. [4. überarbeitete Auflage](Heidelberg, C.F. Müller, 2013), ed. Behrends, O.; Knütel, R.; Kupisch, B.
DAI. Athenea. (Athen, Deutsches Archäologisches Institut, 2014) 120 S., Abb. East and West in the world empire of Alexander. Essays in honour of Brian Bosworth. (Oxford, Oxford University Press, 2015), ed. Wheatley, P.; Baynham, E.
Eclats d’antique. Sculptures et photographies. Gustav Mendel à Constantinople. (Paris, Colin, 2013), ed. Poulain, M.; Queyrel, F.; Paquot, G.
Eclats de littérature grecque d’Homère à Pascal Quignard. Mélanges offerts à Suzanne Saïd. (Paris, Presses universitaires de Paris ouest, 2012), ed. Dubel, S.; Gotteland, S.; Oudot, E.
From ancient to modern. Archaeology and aesthetics. [Institute for the Study of the Ancient World at New York University, February 12, 2015 – June 7, 2015](Princeton, Princeton University Press, 2015), ed. Chi, J.Y. ; Azara, P.
Històries en miniatura. Les nostres primeres monedes. Historias en miniatura. Nuestras primeras monedas. Tresors del Museu de prehistòria. (Valencia, Diputació de València, 2014), ed. Gozalbes, M.; Sánchez, A.
Iberia. Protohistory of the far west of Europe. From neolithic to Roman conquest. (Burgos, Universidad de Burgos, 2014-15), ed. Almagro Gorbea, M.
Ierotopija ognja i sveta v kulture vizantijskogo mira. Hierotopy of light and fire in the culture of the Byzantine world. (Moskva, Feorija, 2013), ed. Lidov, A.
Immagini e memoria. Gli archivi fotografici di istituzioni culturali della citta di Roma. Atti del convegno, Roma, Palazzo Barberini, 3 – 4 dicembre 2012. (Roma, Gangemi, 2015), ed. Fabjan, B.
Jews, Christians, and the Roman empire. The poetics of power in late antiquity. (Philadelphia, University of Pennsylvania Press, 2013), ed. Dohrmann, N.B. ; Reed, A.Y. Konstruierte Sichtbarkeiten. Wissenschafts- und Technikbilder seit der frühen Neuzeit. (München, Fink, 2006), ed. Hessler, M.
La neolitizzazione. Tra Oriente e Occidente. Atti del convegno di studi, Udine, 23 – 24 aprile 1999. (Udine, Comune di Udine, 2000), ed. Pessina, A.; Muscio, G.
La Tribuna del Principe. Storia, contesto, restauro. Colloquio internazionale Firenze, Palazzo Grifoni, 29 novembre – 1 dicembre 2012. (Firenze, Giunti, 2014), ed. Natali, A.; Nova, A.; Rossi, M.
Lamagna, G.; Neri, N.F. ; Merendino, A.: La fortificazione di Adranon. Scavi e valorizzazione. (Palermo, Regione siciliana, 2013) 77 S., Abb. Le donne nello sguardo degli antichi autori cristiani. L’uso dei testi biblici nella costruzione dei modelli femminili e la riflessione teologica dal I al VII secolo. (Trapani, Il Pozzo di Giacobbe, 2013), ed. Børresen, K.E. ; Prinzivalli, E.
L’epigrafe di Marcus Arrecinus Helius. Esegesi di un reperto. I plurali di una singolare iscrizione. Atti della Giornata di studi (Senorbì, 23 aprile 2010). (Senobrì, Società cooperativa “Sa domu nosta”, 2011), ed. Forci, A.
Nemrud Dagi. Recent archaeological research and conservation activities in the tomb sanctuary on Mount Nemrud. (Boston, de Gruyter, 2014), ed. Brijder, H.A.G. Papanikolaou, A.: E apokatástase tou Erechtheíou (1979 – 1987). E apódose tou érgou. (Athènes 2012) 2 Bde., ed. Mallouchou, P.; Bouras, C.
Pergamon. Anadolu’da hellenistik Bir Baskent. A hellenistic capital in Anatolia. (Istanbul, Yapi ve Kredi Kültür Sanat Yayincilik, 2014), ed. Pirson, F.; Scholl, A.
Poïkiloï karpoï. Poikíloi karpoí. Récoltes diverses. Exégèses païennes, juives et chrétiennes. Etudes réunies en hommage à Gilles Dorival. (Aix-en-Provence, Presses universitaires de Provence, 2015), ed. Loubet, M.; Pralon, D.
Precious antiquities. The Profan Museum in the time of Pius VI. [Exhibition, Vatican Museum, Room of the Aldobrandini Wedding, 2 October 2013 – 4 January 2014. ](Città del Vaticano, Edizioni Musei Vaticani, 2013), ed. Cornini, G.; Lega, C.
Roman in the provinces. Art on the periphery of empire. (Chestnut-Hill, McMullen Museum of Art, 2014), ed. Brody, L.R. ; Hoffman, G.L. State correspondence in the ancient world. From New Kingdom Egypt to the Roman empire. (Oxford, Oxford University Press, 2014), ed. Radner, K.
Tacitus. Oxford readings in classical studies. (Oxford, Oxford University Press, 2012), ed. Ash, R.
Tarteso, el emporio del metal. (Córdoba, Almuzara, 2013), ed. Campos, J.M. ; Alvar, J. The ancient Jews from Alexander to Muhammad. (Cambridge, Cambridge University Press, 2014), ed. Schwarz, S.
The Langobards before the Frankish conquest. An ethnographic perspective. (Woodbridge, The Boydell Press, 2009), ed. Ausenda, G.; Delogu, P.; Wickham, C.
The Oxford handbook of Roman sculpture. (Oxford, Oxford University Press, 2015), ed. Friedland, E.A. ; Grunow Sobocinski, M.; Gazda, E.K. Tragedy and archaic Greek thought. (Swansea, The Classical Press of Wales, 2013), ed. Cairns, D.
Tributes to Pierre du Prey. Architecture and the classical tradition from Pliny to posterity. (London, Harvey Miller Publishers, 2014), ed. Reeve, M.M. Vasi di vini. Viaggio attraverso 180 boccali da vino in Friuli Venezia Giulia dal III sec. d.C. al ‘900. [Aquileia, Ex magazzini Pasqualis, 30 ottobre – 30 dicembre 2004](Aquileia, Gruppo archeologico aquileiese, 2004), ed. Blason Scarel, S.; Caillat, G.
Westbrook, R.: Ex Oriente lex. Near Eastern influences on ancient Greek and Roman law. (Baltimore, Johns Hopkins University Press, 2015), ed. Lyons, D.; Raaflaub, K.
When the Greeks ruled Egypt. From Alexander the Great to Cleopatra. (Princeton, Princeton Library Press, 2015), ed. Casagrande-Kim, R.
Posted in Archäologische Bibliographie, Projekt Dyabola, Update Announcements | Comments Off on In May 2431 new titles for the `Archaeological Bibliography´. Evaluated 197 monographs and 100 volumes of periodicals!